"There goes another Townsend rocket-pass!" So sounded the half-groan, half-chuckle from a spectator perched high in Murrayfield's south stand. Scotland's playmaker, with a gracious snap of his wrists collected a pass and flicked the ball onwards to where a gap in the opposition defence could be plundered. A moment of poise and grace - if only the team-mate on his outside had read his intentions. The ball flew over the touchline and bounced meekly onto the track. That Gregor Townsend could be so criticised on that evening 15 years ago, where he scored 33 points as the USA - then little more than part-time cannon fodder - were marmalised was telling. In the eyes of so many, he could seldom unshackle himself from the "mercurial maverick" label. 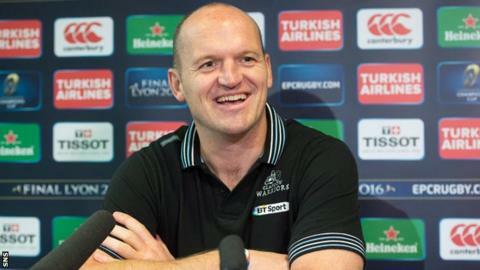 That the Galashiels lad who left the Borders to mix it with the big boys of England, France and South Africa, winning 82 caps before returning to sign off at his cherished Netherdale, has emerged as such a prolific coaching kingpin at Glasgow Warriors might surprise those onlookers. "It doesn't happen that way," explains Jim Telfer, the iconic sage who coached Townsend, at fly-half and centre, for Scotland during the 1990s and on the fabled British and Irish Lions tour of South Africa in 1997. "Some of the most flamboyant players have become very conservative coaches. "Gregor isn't conservative. He wasn't a difficult player to coach. He was very articulate - if he did something wrong, he could always talk you through why he did it. "He will have to do that with his own players, particularly people like Finn Russell or Stuart Hogg. "He could see things at stand-off that other players couldn't see. If he made what you might think were rash decisions, they were done for a reason. It wasn't just to be a devil or a rascal. "He wasn't as mercurial as people think. When he went on the 1997 Lions tour, he was very controlled. Because he had very good players outside him, he used them very well. "Probably with some of the other teams he played for, he thought he had to do a lot himself." The way Townsend has his Warriors playing, of course, has Telfer purring, more pussycat than grizzly bear. The all-action, offloading game appeals to the New Zealand-inspired Telfer mould of controlled but deadly high-tempo rugby, underpinned by ruthless rucking. But after the crowning glory of the Pro12 title barely six months ago, the wily old warhorse cautions Glasgow may face their stiffest test yet this season. "The players Gregor has at Glasgow - not just the backs, but the forwards as well - are all very positive in what they are trying to do," he says. "But as a coach and a set of players, they will find this season more difficult than last, because the opposition know where they are coming from. "They will have to take that next step to be able to take their game forward. But I like the way they play. "With the half-backs they have, they can still control the game even when the weather is not very good." Dignified, amusing and erudite before the flashbulbs and cameras, anyone who has spent even a fleeting moment in vague proximity to Townsend's matchday gantry at Scotstoun can vouch for the ferocity of his competitive drive. His right-hand man, Matt Taylor, may pound the desk in front of him and bawl at the Warriors defensive line to, in polite terms, shape up, but Townsend too oft-cuts an animated figure. It is he who fuels the club and the squad's constant, insatiable thirst to improve and fine-tune. "Gregor's great ability is that he is a modern coach," reckons Telfer. "He has got a good philosophy; he is a very positive coach. "He knows what he wants to do, and he can articulate that to the players. He seems to be very good at bringing young players through. "He won't necessarily realise it but he will be taking ideas from every place he has been, using his experiences and that will be coming out in his coaching. "It also helps when you are bringing in players from other countries. He can at least relate to where they come from." With his deal due to expire in the summer, Townsend penned a contract extension on Thursday that ties him to Scotstoun for a further year. The sighs of relief reverberating across Glasgow sit in stark contrast to the disquiet that surrounded his appointment three years ago, when many felt predecessor Sean Lineen had been unjustly moved on. "I think it ends the speculation of the last couple of weeks that he might be going elsewhere," says Telfer. "Coaches don't seem to last very long. If they are successful, they tend to be poached by other clubs or countries. "It is very good news for Glasgow and Scottish rugby. I think he has done a remarkable job at Glasgow. Obviously he has something to live up to now after last year. "The test of his coaching will be this season, when you are expected to do well, and the opposition are just as tough." The inevitable follow-up, and perhaps the fervent hope amid Scottish supporters, is that Townsend ultimately takes charge of the national team. "He is quite an inexperienced coach when you think about it," muses Telfer. "He has only been a club coach for three years, having been in the Scotland set-up [as attack coach], where he was kind of sheltered, he wasn't the front man there. "From the point of view of his development, I think it is a good thing he is staying on. "He has to think about his family, he has two boys of early secondary school age. As a player he moved around quite a lot - his family have quite a lot on their passports. "If he wanted to do it at a higher level, he has to test himself before he thinks about international set-ups. "Because coaching a national side is completely different to coaching a club side. You get fewer turns at being successful, fewer games, and you have to get it right. There is a huge difference."